Developed in 1967 by Richard Arms, this volume-based breadth indicator can be applied over various time periods. The Arms Index (also known as TRIN, an acronym for TRading INdex) was developed in 1967 by Richard Arms. It is a volume-based indicator that determines market strength and breadth by analyzing the relationship between advancing and declining issues and their respective volume. The Arms index is used to measure intra-day market supply and demand, and it can be applied over short or long time periods, though it is primarily used as a short-term trading tool. The result of this formula can then be smoothed by using a logarithmic transformation - since a simple moving average produces a positive bias - to show historical trends. The moving average is a popular tool, and is calculated by adding up the logarithm of each daily reading, dividing by the number of readings, and then taking the antilog of the result to come up with the final number. For short-term analysis and traders, it's suggested that a four or five-day moving average be used. For mid-term traders, a 20- or 21-day average is appropriate, and, for those using a long-term approach, a 55-day moving average is the one to use. However, it's worth noting that moving averages are lagging indicators that don't necessarily have predictive value. An index value of 1.0 indicates that the ratio of up volume to down volume is equal to the ratio of advancing issues to the declining issues. The market is said to be in a neutral state when the index equals 1.0, since the up volume is evenly distributed over the advancing issues and the down volume is evenly distributed over the declining issues. Many analysts believe that the Arms Index provides a bullish signal when it's less than 1.0, since there's greater volume in the average up stock than the average down stock. In fact, some analysts have found that the long-term equilibrium for the index is below 1.0, potentially confirming that there is a bullish bias to the stock market. On the other hand, a reading of greater than 1.0 is typically seen as a bearish signal, since there's greater volume in the average down stock than the average up stock. A final important thing to remember is that bullish and bearish readings can indicate that a market reversal is near when they approach extreme levels. 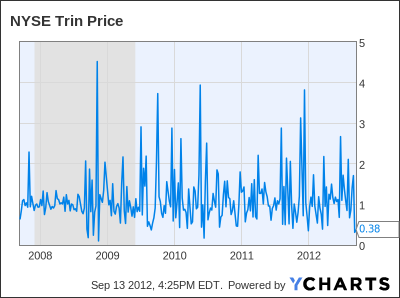 The NYSE TRIN is one of the most popular uses of the ARM Index for the NYSE, but there are also indicators calculated on many other popular indices, such as the NASDAQ and Russell 2000. In general, these indicators are helpful to those trading broad market index futures, such as the SPDR S&P 500 ETF (ARCA:SPY), SPDR Dow Jones Industrial Average ETF (ARCA:DIA) or the PowerShares QQQ Trust ETF (Nasdaq:QQQ). The Arms Index can also be used for investors trading in specific industries or sectors. For instance, those trading gold stocks can calculate readings for a basket of gold stocks to get a better idea of where the group is headed. The Arms Index has a few mathematical peculiarities that traders and investors should be aware of when using it. Since the index emphasizes volume, these inaccuracies arise when there isn't as much advancing volume poured into advancing issues as expected. This may not be a typical situation, but it's a situation that can arise and could potentially make the indicator unreliable. Suppose that a very bullish day occurs where there are twice as many advancing issues as declining issues and twice as much advancing volume as declining volume. Despite the very bullish trading, the Arms Index would yield only a neutral value of (2/1)/(2/1) = 1.0, suggesting that the index's reading may not be entirely accurate. Suppose that another bullish scenario occurs where there are three times as many advancing issues as declining issues and twice as much advancing volume than declining volume. In this case, the Arms Index would actually yield a bearish (3/1)/(2/1) = 1.5 reading, again suggesting an inaccuracy. One way to solve this problem would be to separate the two components of the index into issues and volume instead of using them in the same equation. For instance, advancing issues divided by declining issues could show one trend, while advancing volume over declining volume could show a separate trend. These ratios are called the Advance/Decline ratio and Upside/Downside ratio, respectively. Both of these could be compared to tell the market's true story. Still, the indicator can be extremely useful when used as-is during normal market conditions. It's important to never to rely on only one indicator and have a strong fundamental understanding of why the current market trend is in place and what factors, if any, might emerge and change the current perceptions on fundamental valuations. From a technical standpoint, before trading, it is best to wait for price confirmation or a strengthened argument by support from other indicators and market data. Another note of interest is that the Arms Index looks contrary to the market, meaning that peaks or tops are oversold positions and bottoms are overbought positions. The Arms Index is a great volume-based indicator for traders and investors to use when gauging market supply and demand dynamics. Generally, a reading of above 1.0 is considered to be bearish, while a reading below 1.0 is considered bullish. However, investors should be aware that there are a few instances when the index will give unusual readings and no indicator should be used alone without considering other market factors and/or waiting for confirmations. ArmsInsider.com - Richard Arms' official website, providing information about the Arms Index and other strategies that he uses. Profits in Volume - Richard Arms' book about equivolume charting and the theories behind the Arms Index and other techniques.